Microsoft makes a whole lot of money selling software. But it also gives a lot of it away for free. Here’s a collection of useful free Microsoft apps for all sorts of devices — not just Windows PCs, but also Macs, iPhones, and even Android devices. These apps will help you take photos, share them, give you access to your documents, notes, organise your travel and more. Photosynth is a tool that lets you create a 3D photograph, known as a synth, which is a collection of overlapped photos. This is available for Windows Phone and iOS, or can be used on the Web. The 3D view allows you to navigate photos in all sorts of ways, whether its a tour of your home or climbing a mountain. ICE (Image Composite Editor) works with Photosynth to create panoramic images. The panorama can be shared with friends and viewed in 3D by uploading it to the Photosynth web site. Or it can be saved a wide variety of image formats, from common formats like JPEG and TIFF to the multi-resolution tiled format used by Silverlight's Deep Zoom and by the HD View and HD View SL panorama viewers. 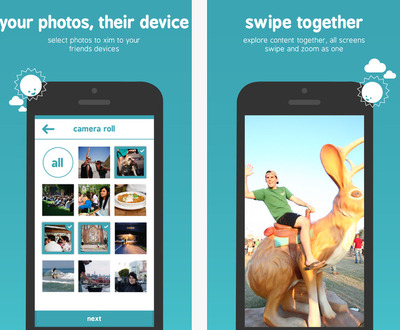 Microsoft Xim lets you share up to 50 photos with friends via your Windows Phone, iOS, or Android device. Photos appear synchronously on everyone's devices even if they don't have the app. Anyone in 'a Xim' can advance the slide show or pan and zoom to see specific photo details. Skype Qik is sort of like Snapchat. 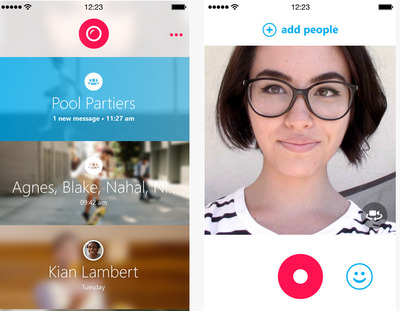 Skype Qik is a free Snapchat-like app. But it's not limited to snaps. You can also send video clips, and they don't vanish right away. New messages can be added to a chat that you can watch like a movie with a single tap. Qik also lets you erase your video right out of the chat. It's free for Windows Phone, iOS, and Android. 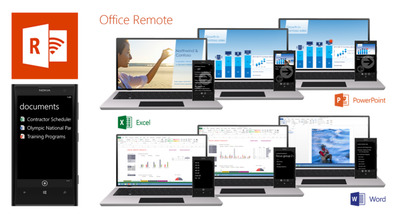 Office Remote turns your mobile phone into a smart remote that interacts with Microsoft Office documents like a PowerPoint on your PC, iPad, or iPhone so you can walk around during presentations. It's available for Windows Phone 8, iPad, and iPhone. SmartGlass lets your phone or tablet interact with your Xbox. 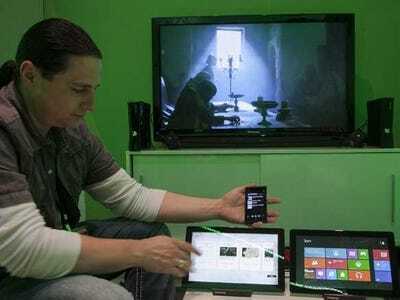 Xbox SmartGlass turns your mobile phone or tablet into a second screen that intelligently interacts with your Xbox. It allows your devices and TV to talk to each other so you can control your Xbox One, chat with other gamers, or add another dimension to using Xbox. It works on Windows Phone, Windows 8.1, iPad and iPhone, Android, and Amazon Fire. 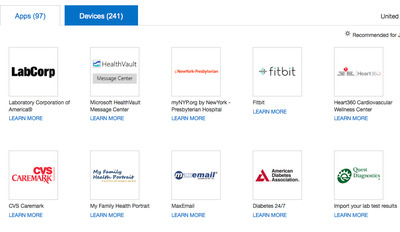 Microsoft Health helps track your fitness. 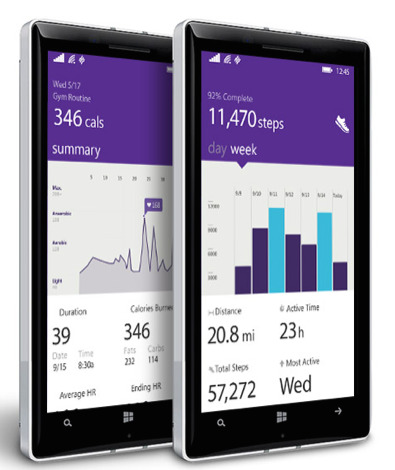 Microsoft Health tracks your fitness devices and goals and works with Windows Phone, iOS, and Android. It's the support app for Microsoft's new fitness device, Band, but it also works with other devices to track your heart rate, steps, calorie burn, and sleep quality. With Band, you can use it as a personal trainer with Guided Workouts. The app is free. Band costs $US199. HealthVault is an online storage service for medical info. Before there was Microsoft Health there was HealthVault, which is a central spot to keep track of medical files and information. You can also use it to connect to health devices like heart rate monitors, blood pressure monitors, peak flow meters, and glucometers, and upload this data to your Windows PC. OneNote is a note-taking app. 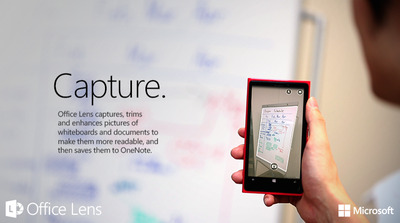 OneNote is Microsoft's note-taking app. Microsoft released it as a free stand-alone app for PCs, Macs, iOS, Android, Windows Phone, Kindle, and with Web browsers. You can clip web pages, photos, and audio files. You can also email notes to yourself using a special email address. OneNote has been around for years so it integrates with lots of other apps like Feedly, electronic pens like Livescribe. You can also connect it with other web apps through the online hook-up service known as IFTTT. Office Lens makes your mobile device into a scanner. Office Lens turns your mobile device's camera into a scanner. It trims, enhances, and makes pictures of whiteboards and docs readable. The images are automatically synced to OneNote, so it's accessible on all your devices. When your picture includes printed text, such as a poster or business card, OneNote on a PC can recognise the text so you can search for words within the image or edit the text. It works with Windows Phone and its built into OneNote for Mac, OneNote for iPad and OneNote for iPhone. Remote Desktop lets you tap into another PC from far away. 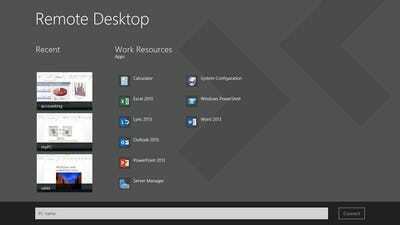 Microsoft Remote Desktop lets you be on one device and connect to another PC in a different location. For example, you can connect to your work PC from your home PC and access all of your apps, files, and network resources as if you were sitting right in front of your work PC. It works with Windows, Mac, Android, and iPad and iPhone. Torque puts Bing on Android Wear devices. 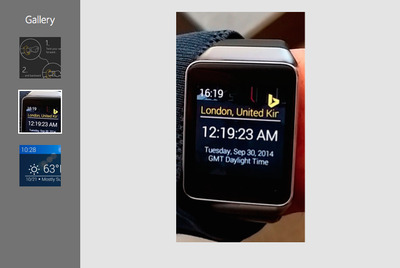 Torque puts Bing on Android Wear devices as an alternative to the 'OK Google' voice command app. 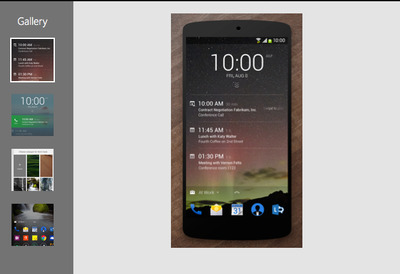 Next Lock Screen puts Office info onto your Android lock screen. Next Lock Screen is an Android app that lets you put information from Microsoft Office onto your lock screen, like your calendar, missed calls, and text messages all at a glance. You can also connect to a conference call (directly from a meeting reminder) in a single tap without unlocking your phone. Next Lock Screen will also hunt out the apps you use most based on your location. 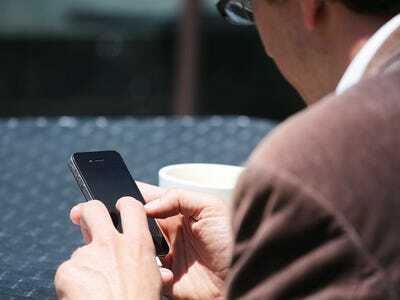 MSN Travel lets you plan and book travel from your phone. 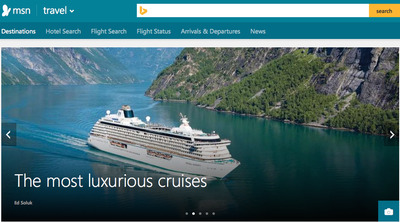 MSN Travel includes thousands of destination guides, photos, maps and reviews of hotels, restaurants, and places to see. You can search flights to compare prices from multiple airlines, pin your flight to your start screen, track your flight status, book. last-minute flight or hotel reservations. It's only available on Windows and Windows Phone, but Microsoft says its coming soon to iOS and Android. MSN Food & Drink has a ton of recipes. 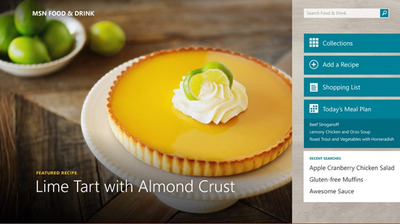 MSN Food & Drink gives you access to over 100,000 recipes. You can create recipes collections with wine and cocktail pairings, watch how- to videos from world renowned chefs, save your favourite recipes and drop them into an easy to use shopping list that syncs across your devices. It's only available on Windows and Windows Phone for now, but Microsoft says its coming to iOS, Android, and Amazon Fire. Sway is like an updated version of PowerPoint. 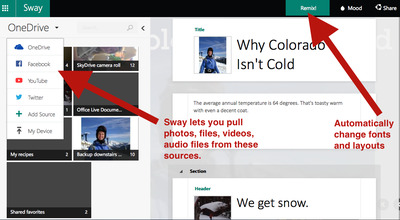 Microsoft Sway is easy to use. Sway is Microsoft's new 'Prezi killer' online presentation app that's not quite generally available. The preview app works in a browser and Microsoft is working on mobile app versions for Windows, iOS, and other platforms. It is expected to be available in March. 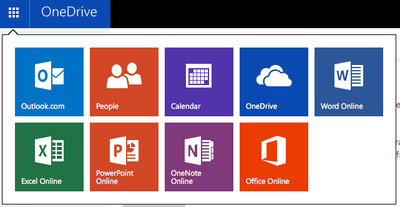 OneDrive, once a storage service, now includes a free online version of Office. OneDrive was Microsoft's online storage service, a competitor to Dropbox and Google Drive. Now, includes online storage and Office Online, cloud versions of email (Outlook.com), an address book, calendar, Word, Excel, PowerPoint, and OneNote. You can use it as an app on Windows Phone 8, Windows 8, iPhone, iPad, and Android, as well as in a browser on PC or Mac. 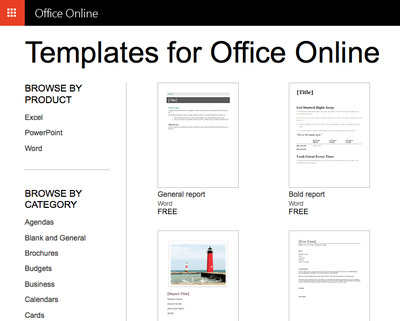 Templates for Office Online help you create things. Templates for Office Online is a huge assortment of free document templates available for its free online version of Office. It can help you do things like create a birthday invitation or resignation letter. There are over 30 categories of templates for Excel, PowerPoint or Word (agendas, budgets, certificates, college tools, diagrams, flyers, invoices, resumes). 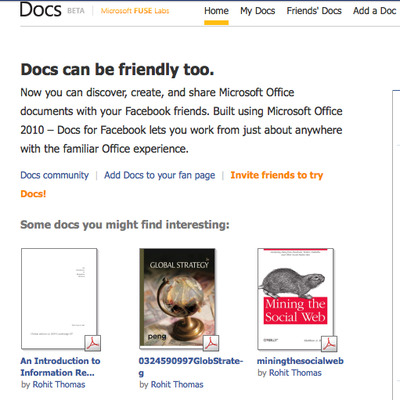 Docs for Facebook is Office as a Facebook app. Docs for Facebook is a version of Microsoft Office available as a Facebook app. So you can create a Word document or a PowerPoint or an Excel spreadsheet while you are on Facebook to share with your Facebook peeps. You can use it for things like sharing a recipe, or individual chapters of a book you are writing and so on. Office 365 Nonprofits gives Office away for free to nonprofits. Office 365 Nonprofits is a free version of Office 365 for nonprofit organisations. It is beefier than the freebie version of Office available to consumers called Office Online. It includes email and word, Excel PowerPoint, Outlook, but also web conferencing, Yammer, other features.